This is a photograph of actor Ryan O'Neal as he appeared in a 1964 episode of the classic Perry Mason television series. The episode is entitled "The Case of the Bountiful Beauty (Season 7, Episode 17, Air Date: February 6, 1964). O'Neal, born April 20, 1941, was just 23 years old when it was originally shown on CBS. In the episode, he played John Carew, who tells his girlfriend, author Deborah Dearborn,(Zeme North) some unflattering stories about his stepmother, Stephanie Carew (Sandra Warner). 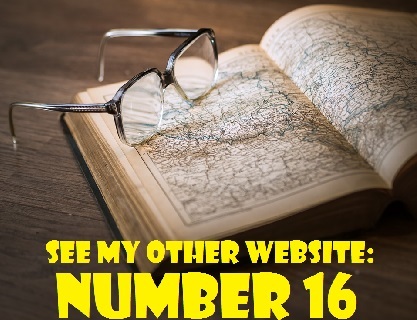 Dearborn unwittingly uses the stories to write a highly successful book. When a dismayed Stephanie attempts to launch a libel suit against Dearborn, the result is murder. It should be remembered that Ryan O'Neal was not a big television star at the time of his appearance on Perry Mason. 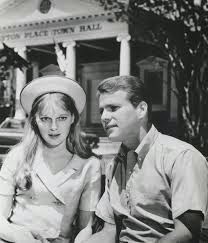 The episode was broadcast before the debut of Peyton Place, the prime time soap that catapulted him to stardom along with co-star Mia Farrow (Allison Mackenzie). The first episode of Peyton Place was broadcast on September 15, 1964, some seven months and 9 days after the Perry Mason episode was aired. O'Neal played the role of Rodney Harrington on the show until 1969. Although he is not regarded as a cowboy actor, Ryan O'Neal was cast in some Western dramas prior to his breakthrough on Peyton Place. He had guest roles on two popular Westerns during the early 1960s: Wagon Train (1964) and The Virginian (1963). He also had a major role in a short-lived Western series called Empire. He portrayed Tal Garrett on the show, which only lasted for one season (1962-63). Back in 1962, O'Neal appeared in an episode of the long-running Fred MacMurray sitcom, My Three Sons. In the My Three Sons episode, "Chug and Robbie" (Season 2, Episode 33, Air Date: May 17, 1962), he played Chug Williams, a star athlete at Robbie Douglas' (Don Grady) high school. Robbie attempts to make friends with with Chug until he learns that the big man on campus is using him for homework assignments. In 1961, Ryan O'Neal had guest spots on both Leave it to Beaver and Bachelor Father. In the Leave it to Beaver episode, "Wally Goes Steady" (Season 5, Episode 1, Air Date: September 30, 1061), O'Neal played Tom Henderson, the hrother-in-law of Wally Cleaver's steady girlfriend, Evelyn Boothby (Mary Mitchel). Wally's parents, June and Ward, become concerned that Wally and Evelyn are spending too much time with the older married couple. In the Bachelor Father episode, "Bentley and the Great Debate" (Season 4, Episode 29, Air Date: April 13, 1961), O'Neal portrayed the high school basketball team's star player, Marty Braden, who engages in a public debate with a shy, awkward fellow student to determine the fate of the team's unpopular coach. 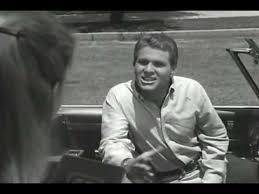 One of Ryan O'Neal's earliest television roles was in a 1960 episode of The Many Loves of Dobie Gillis in an episode called "The Hunger Strike" (Season 1, Episode 17, Air Date: January 26, 1960). O'Neal played a character named Herm inhe episode in which Dobie Gillis (Dwayne Hickman) goes on a hunger strike to win the heart of Thalia (Tuesday Weld). It is interesting to note that Marlo Thomas (then known as Margaret) had a role in the same episode.